Interesting living spaces; that’s what you’ll find here. One of the first features that really strikes as one enters this lovely Victorian styled home is the wall of windows that looks out onto Army Corps forest. Although tucked into a charming section of Chancellors Ridge in southwest Durham this home has a feel of space. The hardwood flooring in the spacious living room has been recently refinished and the room is flooded with natural light. Adjoining is a large dining room and a modern kitchen with stainless appliances and ample work room. The master suite is on the main level and is served by a spa bath and tremendous walk in closet. Upstairs are three additional bedrooms and bonus loft space with windows that open to the vaulted kitchen. Outside is extensive decking, landscape with hundreds of flower bulbs and blooming shrubs and hardscape patio and walling finished in Duke Stone. A detached two car garage is accessed by rear alley and a pocket park is located across the street. 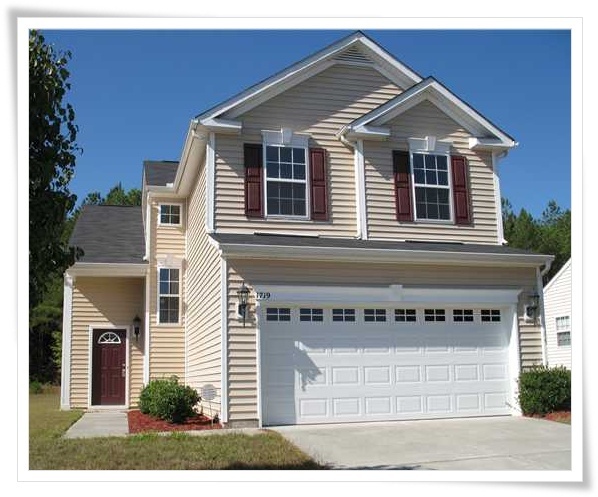 Chancellors Ridge community amenities are just a short walk from this home. Walk to Oval Park, Ninth Street or Duke a location that is very hard to beat. This home is done and done well, bring your belongings and you’re done. The hallmark of this fine home is the kitchen. Here you’ll find new Granite counter tops, a new ceramic backsplash, new appliances and a vaulted ceiling full or architectural detail that adds charm and character to an amazing space. Throughout the first floor are freshly refinished hardwood floors, fresh paint, huge windows that floor the house with natural light and a very flexible floor plan. Each of the two baths has been updated with custom ceramic tile and décor colors. Upstairs the attic has been finished too in order to provide bonus, bedroom, office or any other type of flexible space. There are gracious porches and patios and decks for outdoor living and the back garden is truly and urban oasis. Additionally there is a two car garage for cars, tools or a workshop. Someone’s misfortune is often an opportunity for someone else. Any way you slice it, foreclosure is sad, tragic even but more and more foreclosed homes that are coming on the market are in really terrific shape. 111 Chancellor’s Ridge Drive is just one of those properties. At over 2400 square feet, with gracious light filled living spaces, new wall to wall carpet in the living room and dining room and hardwood floors in the kitchen, foyer and breakfast area, this home makes a splash. Upstairs are three large bedrooms and two baths and on the third floor is a HUGE bonus room which could also be a bedroom if needed. The paint and appliances are in good shape and the yard with a little love would be a show stopper. Additionally the location is top notch and the neighborhood offers amenities. What you can’t see in the photo is that a two car garage is accessed by the rear alley behind. So does this home bling like new construction? No, but it appears to be a solidly built home, with few apparent issues and a heck of a deal at $244,900. 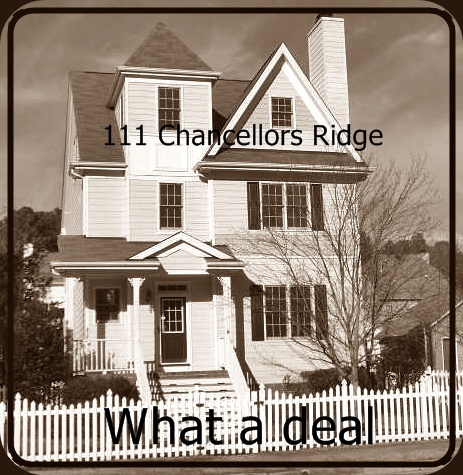 Want to find the best real estate deal in the Triangle Region? Phone, text or email me today. So, whatever my role with clients my value to those clients really is in my knowledge base. What I’ve learned with my 17 years experience and what I continue to learn. Essentially, when helping buyers, I first have to help them narrow down exactly what it is that they want and what they want to spend. Through an interviewing process we decide what kind of home would best fit the buyer’s needs, what location they want and what they want to spend. With respect to spending, there is so much more than mortgage payment and interest rates; we have to consider taxes, HOA fees if any, heating costs, cooling costs, maintenance and commuting costs if applicable. We have to consider time expenses too; such as lawn care and general maintenance time too. Additionally we may also need to consider modernization time costs. Most importantly in helping buyers is helping them understand what their money will or won’t buy. I have to gently guide a buyer sometimes to the understanding that $120,000 will not buy a home with four bedrooms, two and a half baths, two car garage, twenty- two hundred square feet, five minutes from Duke University and on an acre of land. It will get you a nice smaller cottage or a townhouse or perhaps a house thirty to forty five minutes north of Durham. Distressed properties are a possibility too in that price range. I also am charged with educating both buyers and sellers through the process and standardized paperwork. I also have to point out eventualities and what ifs. So much of this part of my career is dependant on my ability to properly and clearly communicate with my clients; whether buyer or seller clients. I need to be accutely aware of my licensing limitations too; it is important for me to refer to attorneys, surveyors, contractors and so forth when other professional advice is needed. I am in many ways still a teacher but I’m also a counselor, negotiator and a go to guy; my responsibility is to ensure that the process for my clients is enjoyable and enlightening. Finally, most buyers have every intention of being in their new homes for a very long time, but I must keep a keen eye on the possibility that one day I might need to resell their new home; in my mind I am always asking myself what are the value added features are of any property? Built in 2005, one owner and gently, yes GENTLY lived in. This home is just five minutes to RTP and about ten to Duke, Duke Hospital and the VA Hospital. Truly the property shows as nearly new, with nine foot high ceilings, a fantastic LEVEL lot, worry free vinyl siding, gas fireplace, modern kitchen, luxury master retreat, tremendous amount of closet space and a neighborhood that offers a community pool and playground. For a total of 1800 heated square feet, three bedrooms, two and a half baths, a bonus room formal living room and dining room and nearly a third of an acre…the price…drum roll please…$119,900. This home is an AMAZING value. Want to see it? Call or text today. What is it that I do?. So, I thought that I’d go a little wide today with respect to topic and focus in on exactly what it is that I do. I can certainly take on two roles as a REALTOR. I can be a listing agent; with my sign in the yard in front of a home and that of a buyer agent; introducing buyers to homes that may fit their criteria, which sounds simple doesn’t it? So let’s break the two roles apart because they are very different which makes my choice of career very enjoyable and recently challenging. I will tackle this topic over several installments. •	My primary responsibility is to determine what, if anything, are the value added features that would induce a customer to purchase any given home. •	Assist home sellers in pricing their homes by analyzing current market conditions. These conditions are both micro (local) and macro (non-local) factors that might affect home selling and buying. o	Factors directly affecting marketability of the subject property. •	Neighborhood “collectors” with junk cars, couches and perhaps even chickens in the yard. o	Provide detailed and accurate information to those buyers and their agents. •	Report what the market reaction is to the property seller and then offer potential solutions to overcome stated objections. Really that’s it in a nutshell. There are many tools in my arsenal to meet the ends of a fairly good listing agent. The challenge in the last two years has been an all but non-existent home buying consumer which has given me little if anything to report to my home sellers. Next time…Helping Home Buyers, Buy.